It was a shrimp night and I wanted to try something new. Sometimes this works in my favor and other times (usually due to kids making hideous faces) it doesn’t. Tonight was one of the latter. While I liked what I made the kids didn’t seem at all pleased. I threatened to NEVER cook dinner again and reminded them they are going to get rather bored of pb&j, cereal and toaster waffles since that is all they know how to cook on their own. So, we will see how many faces I get on the next dinner I make! I went online and searched on several different recipes for “shrimp and grits”. I don’t know why, I just wanted to try it. I mixed and matched to come up with what I did. Cook bacon in a skillet until it starts to grease the pan. I added olive oil because my bacon pieces didn’t render enough grease to keep the leeks from sticking to the pan. Once heated, add leeks and “sweat” until tender (about 5 minutes). Add shrimp, zest and juice. Cook until pink. Salt and lemon pepper to taste. Add cilantro just before serving so it stays fresh. Cook grits according to package directions. In this case I used Quaker which took 2 1/4 cups of water to 1/2 c. of grits. Having only had grits once in my life, I remembered them to be fairly bland and opted to use stock instead and I doubled a batch. Basically you boil the liquid, add grits slowly, lower temp and cook until thickened. All in all it takes about 20 minutes. I added the butter, cheese, salt and pepper after the grits thickened. I mentioned on my other blog how a friend and I are splitting a share in a local CSA. One of the items in our share the past two weeks was cilantro. YUM! 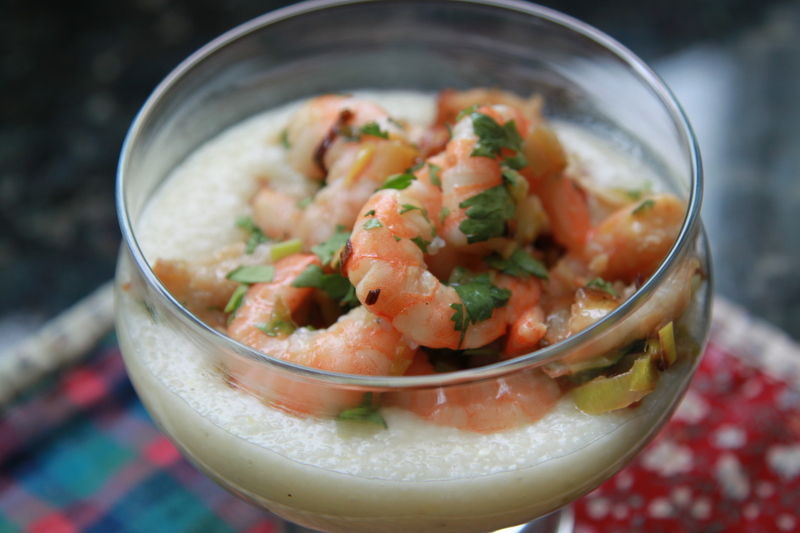 Go make this shrimp dish now. It was that good! Can’t wait to make it again! 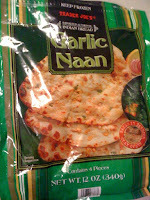 1 Mix together garlic and 1 teaspoon salt. 2 Whisk together garlic paste, lime juice, marmalade, cilantro, 3 tablespoons oil, soy sauce, red pepper flakes, remaining 1/8 teaspoon salt and pepper in a small bowl. 3 Transfer 1/3 of mixture to small serving bowl and reserve for dipping sauce. 4 Combine shrimp with remaining mixture in a large sealable plastic bag and seal bag, pressing out excess air. 5 Marinate shrimp, refrigerated, turning bag once, for 15 minutes. 6 Drain shrimp and gently pat dry. 7 Heat 1 1/2 teaspoon oil in a large non-stick skillet over moderately high heat. 8 Add half of shrimp and cook, turning occasisionly until shrimp is cooked through, about 3 minutes total. 9 Transfer to a platter and cook the remaining shrimp in 1 1/2 teaspoons of oil. 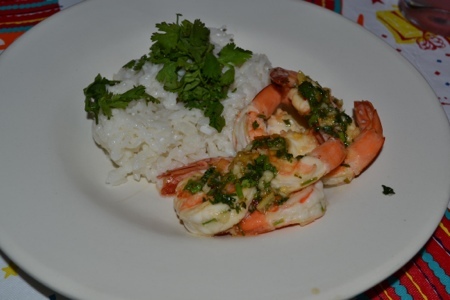 10 Garnish with cilantro and serve with dipping sauce. Reduce heat to low, cover and simmer until all liquid evaporates, about 20 minutes. Remove from heat, keep covered for 10 more minutes. Fluff with a fork; toss with cilantro. Townie asked me before her vacation if I had shrimp. I said, “Of course!”. 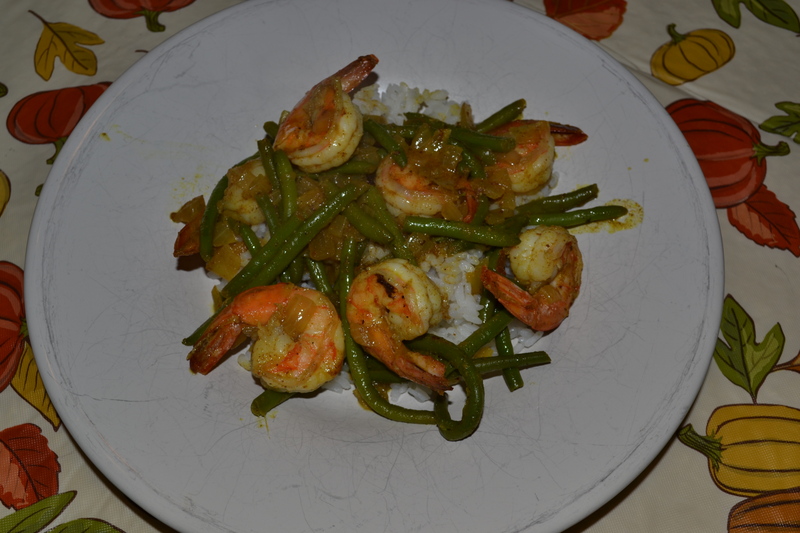 I get going on this totally delicious looking recipe, everything is cooking, water is boiling for shrimp. I open freezer to get shrimp to add to this really yummy dish only to discover the pinkish bag in the freezer that I assumed was shrimp was really salmon! FOUL! I ended up using a can of chicken in place of the shrimp and it was a really amazingly tasty meal anyway. I will make it again and probably post my modifications on another day. But, onto shrimp! Since Townie posted shrimp before she left, I was on base to post something too. I bought a bag of shrimp after dropping the kiddos at day camp yesterday. It was even on sale! SCORE! Today was a busy day and I wasnt in the mood for anything inparticular so out came that pinkish bag, of shrimp this time, for an easy dinner. I made very few modifications to the original recipe I found. I had a bunch of kale in the fridge about to go so it needed used. Heat the olive oil in a large skillet over medium heat. Add the leeks and garlic. Cook for 3-5 minutes, stirring occasionally, until softened, lightly browning and shrinking in mass. Add the shrimp and cook for 2-3 minutes until just turning pink and opaque. Stir. Add the kale, wine and lemon juice. Stir well. Salt and pepper to taste. Let cook without disturbing for 5-7 minutes until the kale begins to wilt. Add the butter and one ladle of pasta water. Stir well. Cook until reduced, another 3-5 minutes. 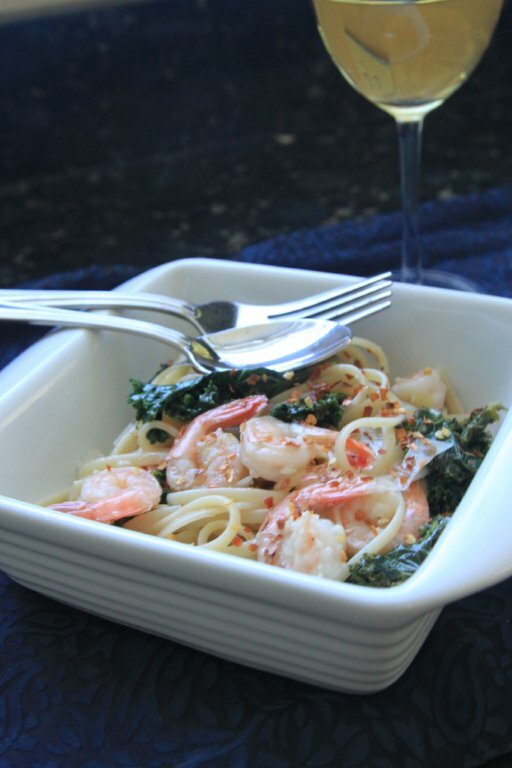 Toss the pasta with the kale and shrimp mixture. Add the Romano and toss again. I topped mine with crushed red pepper flakes to give it a punch. ENJOY! 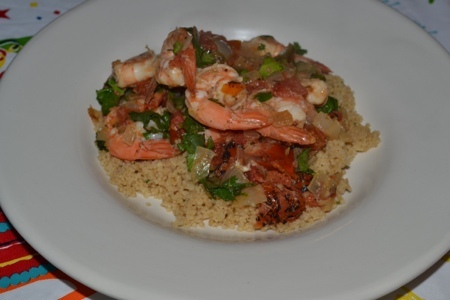 I love making shrimp, it’s healthy, easy, fast and delicious!! This recipe comes via pinterest and turned out delicious! Had a nice kick and was pretty filling. I served over couscous. Decided on shrimp for dinner. It’s easy and the kids will eat it. I found a photo on Pinterest that looked yummy so I clicked through the links until I found the recipe. I had all the ingredients so, it’s what I made. Hubby liked it, the kids ate it because it was put in front of them but they all commented on how spicy it was. Or, as the 2-year old proclaims “my mouf is who-tin”. I didn’t use very much spice at all, but I think cayenne has just the right “kick” to turn the kids off. I think the flavor was good. I will probably make it again. The recipe below is with my modifications. As always, click on the link to see the original. 2. Sprinkle shrimp with salt, pepper, and toss to combine. Sprinkle 1 tbsp flour over the shrimp, and toss to coat the shrimp. Sprinkle 1 more tbsp flour and toss to evenly coat the shrimp. Melt butter and olive oil in a large skillet over medium high heat. When hot, add the shrimp in a single layer and cook on each side, flipping once, until golden brown, approximately 2-3 minutes per side. Remove to plate. 4. Add veggies and cook for about 5 minutes, until tender. 5. 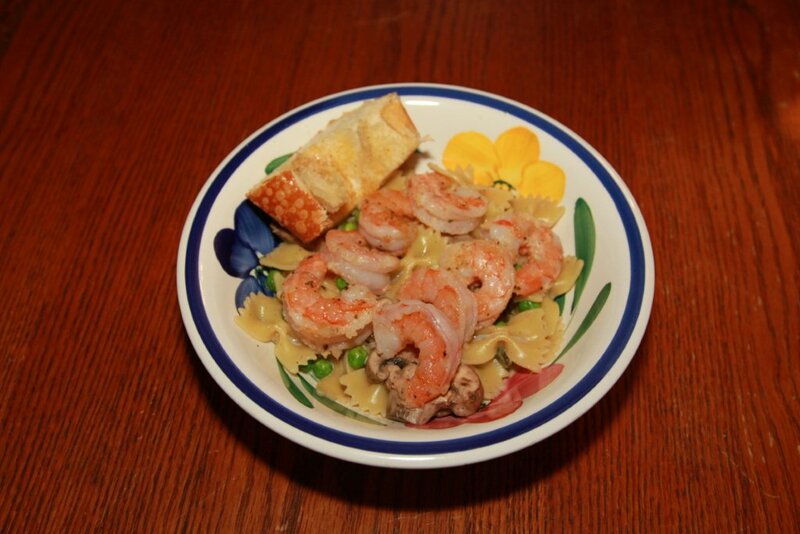 Add the drained pasta and shrimp to the sauce, and stir to combine.